Automatically identify both exact and non-exact matches to either delete duplicate records entirely or merge them to create enriched records using proprietary data matching technology. Research reveals that 94% of organizations have duplicate data in some form. Most corporate databases contain 10-30% duplicate records, resulting in wasted marketing budget, damaged company reputation, loss of customer trust, reduced collaboration between teams, and inefficiency across the enterprise. The removal of duplicates from your systems is, therefore, one of the most important steps in cleansing your data. Incoming data from multiple customer touch-points (retail PoS, email list subscription, etc.) creates duplicates. 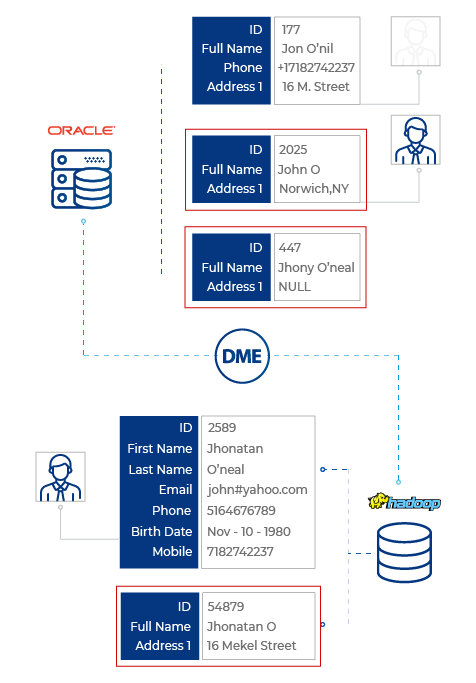 Name variations, typos, and incomplete data make it difficult to identify duplicates across systems. Standard deduplication techniques can only identify exact duplicates, where a unique identifier like ID is present. Businesses have millions of records related to customers, vendors, and employees, often in different databases. These databases have many duplicate records, which results in decreased operational efficiency as well as missing information. Multiple records mean details of the same customer/entity are spread to multiple records. Deleting duplicates and merging the records increases the efficiency of the database while creating a single source of truth. Remove entries for the same customer in multiple contact lists and avoid sending the same materials twice to your customer. Create a clean, deduplicated customer view for use that everyone across the enterprise can use efficiently, confident in its accuracy. Increase employee trust in internal data by deleting duplicates so they don’t have to sift through a lot of data to find the right entry. Comparing and deleting duplicates before merging systems or migration streamlines the process and reduces cleansing effort. 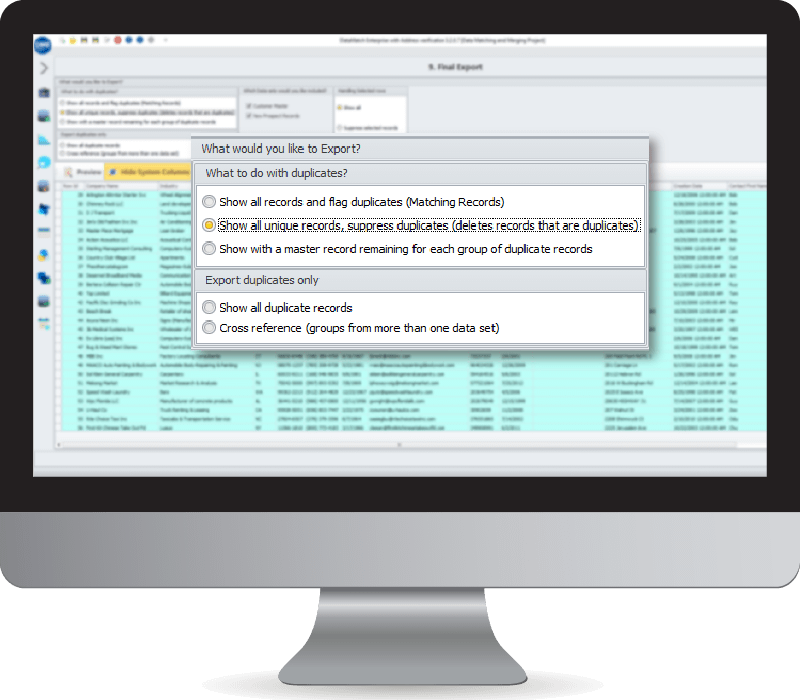 Use world-class, proprietary data matching algorithms to detect duplicates regardless of spelling errors, variations, or incomplete data. Compare duplicates, choose whether to merge to create enriched records, purge them completely, or survive specific data in a separate field. With in-memory processing, you can import and test different duplicate removal settings without consequence, preserving data in source systems. Data Ladder’s data cleaning software deletes duplicate records in lists like email addresses, contacts, customer profiles, and client manifests, identifying fuzzy matching using a combination of proprietary matching algorithms based on decades of research, and established deterministic and probabilistic techniques. The tool is capable of handling even the most complete database architectures so you can ensure deduplication, regardless of whether your list is stored in Salesforce CRM, an Oracle database, or even legacy databases like IBM DB2. One of the critical pieces of eliminating duplicates is survivorship. If you have duplicate records, which one should stay (survive) and which one should go? In this example, we have two duplicate records. Each has some slightly different data in the notes field. You may prefer to keep all the records, but oftentimes a single master record must be chosen to maintain data quality. slightly different data in the notes field. You may prefer to keep all records, but often, a single master record must be chosen to maintain data quality. DataMatch allows for customized settings for which merged data should survive. With DataMatch, you can choose which record survives by choosing which field to merge on and in what order. In this case, it would be the customer number, in ascending or descending order. If in ascending order, the first customer number would hold priority (1005643). If in descending order, it would be customer number 1106789. You can always change which record is a master manually in DataMatch. Unfortunately, normal duplicate removal software routines can delete vital business data. Now, what if you want to keep both pieces of information in the same master record? DataMatch has this capability! The best solution would be to keep all the data that is different in a new field. John Smith 1 Someplace Way 10258 Springfield CO 1005643 Prefers to b... Alternate Information: (Customer Number): 1106789 (Notes): Interested in New Product next month. Comments Alternate Information: (Customer Number): 1106789 (Notes): Interested in New Product next month. Note the alternate information is captured in a new field. The benefit is a single master record, with no vital data loss. (Old customer number kept for referencing, and critical customer comments like interest in a new product – kept). Duplicates and Prepare Your Data?